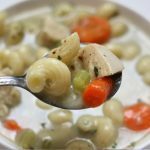 An easy and creamy chicken noodle soup recipe that is perfect for a cold day. And it’s under 300 calories per serving! Add onion, garlic, broth, celery, carrots, oregano, pepper, thyme, salt and chicken into slow cooker. Prepare the noodles according to package directions on the stove. Drain the pasta and add it to the slow cooker. Remove the slow cooker lid and remove the chicken. Place on a cutting board and cut the chicken into pieces or shred it. Return the chicken back into the slow cooker. Stir dairy and cornstarch together in a bowl until smooth. Pour the mixture into the slow cooker. Turn the slow cooker to high and let the soup get thicker and creamy over about 10-20 minutes. Salt and pepper to taste. Ladle into bowls and serve. Heavy cream is the most creamy and decadent. Half and half is still good and milk is less calories and less creamy. Use whatever you prefer. Nutrition information is based on if you used half and half. To make gluten free: Double check your chicken broth to be sure it does not contain gluten. Substitute noodles for GF noodles and cook the noodles separately and add them just before eating, otherwise they get soggy and may dissolve altogether.